Television’s longest-running chase story, The Fugitive was a dramatically charged show that followed Dr. Richard Kimble on his quest to prove his innocence and find his wife’s one-armed killer. A product of veteran television producer-writer Roy Huggins (Maverick, The Rockford Files) and Quinn Martin, a newcomer producer, the series aired for four seasons between 1963 and 1967 on the ABC network. 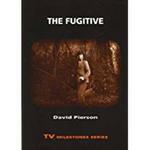 In The Fugitive, author David P. Pierson examines the creation of the series and its dominant social discourses and themes, along with the industry producers, writers, and actors who made it one of the most memorable and influential shows in 1960s American television. In The Fugitive, Pierson discusses the context of the series’ creation at a time when federal regulators were forcing the three major television networks to broadcast adult programs with less physical violence. Pierson also offers a unique analysis of the major themes represented in The Fugitive’s episodes, such as individualism, love and marriage, the culture of professionalism, modern science and technology, and social justice and authority, along with how these themes connected to ongoing social and cultural struggles taking place in American society in the 1960s. The book explores the reasons why The Fugitive was so popular with audiences of the 1960s, and suggests that one of the strongest appeals of the series is the memorable, poignant performance by David Janssen as Richard Kimble. Pierson also argues that The Fugitive established the narrative and thematic grounds for the "wanderer-redeemer television tradition," whose influence he links to later series like Run for Your Life, Then Came Bronson, The Incredible Hulk, Highway to Heaven, Quantum Leap, and Touched by an Angel. Pierson concludes by examining the similarities and differences between The Fugitive and the 1993 feature film based on the series. After a finale that held the record for the highest share of American homes with television sets tuned in, the series ended, but not without creating a cultural and programming legacy. Fans of the show and scholars of television history and American popular culture will enjoy this informative study. Pierson, David P., "The Fugitive" (2011). Faculty and Staff Books. 219.